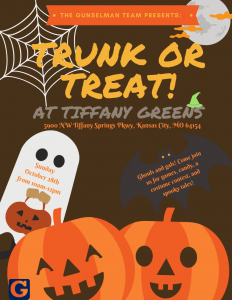 Trunk or Treat For The Kids at Tiffany Greens Golf Club House FREE! The Gunselman Real Estate Team loves to celebrate with friends, neighbors, family, and clients. We are inviting the neighborhood and everyone else to join us in having a trunk or treat for the kids on October 28th from 10am-12pm. I’m positive that if you want to stay and watch the Chiefs game afterwards they would love to have you. Adults- You are encouraged to also be in costumes as we’ll be having a costume contest with prizes given away. The Gunselman Team will be also be taking down contact information if you are interested in adopting a child for Christmas. Last year The Gunselman Real Estate Team Adopted 20 children with providing them everything on their Christmas List.